I was careful not to step on water puddles until I saw a small monk running barefoot towards the monastery. Cold, wet yet excited, entered the main prayer hall.Monks not older than 12 were seated in the last few rows. Other than cute faces, red robes and curious smiles, they all had one thing in common - A white mug.As I expected, the reason was the tea given to them at the end of the prayer. Most seemed happy to get an extra helping. I was just reminding myself about the importance of the 'simple pleasures of life' when a small monk behind me, signaled to his friend who reached into his robe and took out a cola bottle! I clicked my first picture, and he stopped talking, I smiled and took my second and he did the same. it was then that I felt bad. 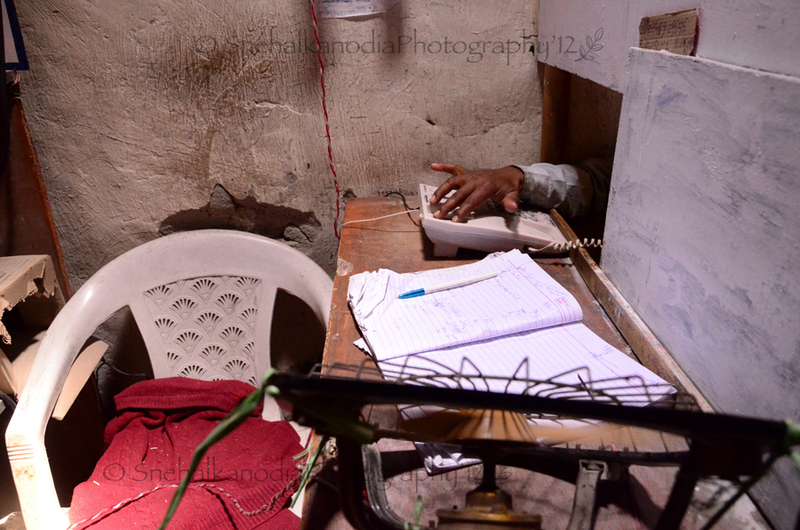 However good the composition might be I cannot interrupt a Bihari man from speaking to his wife back home.Stubborn to make the picture happen I composed it in this way.At that time i thought " this is way different from your style" but i think thats what made all the difference. "Tread slowly, the villagers aren't used to people like us with cameras" Ami had warned us and this I tried to remember at all times. But when I saw these kids for the first time on my very first minutes on our visit to Youl, I couldn't help but stop.not knowing there language I smiled and put my fingers through the mesh. A small hand( more like finger)shake was all it took.There curiosity was noticeable.We weren't the only ones discovering something new, they were too. "One photoo"- the kids in Baltistan would excitedly shout when they saw us with cameras.They would strike stiff poses and shy away when we showed them the photograph.Altaf and Sajjad were two such kids and my first friends there. When they met me, they promised they would show me around Firol and this promise they kept well. From construction sites to donkey sheds, from fields to bridges, we saw them all.Needless to say, I took several pictures and one of them is this.Taken at Sajjad's house, this is Altaf showing off an old deer mask. The antlers are of the deer Sajjads father hunted many years ago. Nazia’s (Sajjads sister) reflection is caught in the glass of the window. I love taking portraits and though this doesn't look like one, it is.They were both walking near the fields, curiously looking at me as I clicked and volunteered to be a part of my picture. Holding hands the twirled and danced, giggled and posed.I am not sure they knew each other well then, but I am sure after this. they will. "We women have been asked not to get our pictures clicked", "But why?" I asked. "The maulvi says you will paste them on bathroom brushes used to clean your toilets". I had nothing to say.This incident did shock me but more than that it instilled faith in peoples objectivity. How many of us have the courage to stand against the powerful and to go against traditional beliefs? The women there did.The easiest would be to listen, kill their desires and show us the door but instead they did. what they felt was right - they allowed me to take their photograph.In every day life, may it be college or at home, during pujas we don’t know the significance of or while sitting in tuition, we fail to question. Even behind a veil, they have achieved far more than many of us ever will. This picture is taken at Hunder.When I opened my folder of the pictures at Hunder I was sure about which picture to upload. The cliche camel silhouette. It was then that I saw this picture. I remember this was the one of the first I had clicked there.Having not spoken to the lady, I didn't have much of a memory of it but i love the shot. 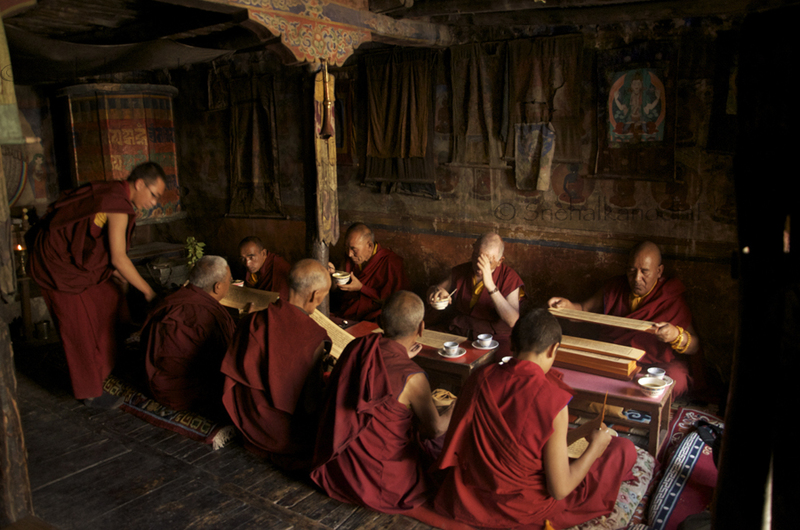 A small room, dimly lit, with 12 monks sitting and sipping butter tea while preparing to read from their scriptures. This was what we saw when we reached the village of Diskit in search of these monks. On the way from Hundur to leh lies a small but old monastery which a few of us thought of covering.When we reached there we were told that all the monks had gone to a ceremony held annually in Diskit, and we were lucky to have found them. I spent a lot of time interacting with Arfana and Gulanz’s family. 3 butter tea’s and half a roti later our friendship had reached a point where the family was willing to shed their inhibitions and ask me to take their family portraits.This is one of those pictures. Spontaneous yet posed – especially when it came to Arfana. She changed into her favorite frock for the occasion.